As I write this post, I am surrounded by a sierra of clothing, an unmade bed, books haphazardly flung across my bedroom floor and a checklist as endless as the Mahabharata. I am preparing for my brief trip to San Francisco tomorrow morning (more on that in a later post), and I figured that I’d share a recipe for Brown Butter Carnival Bars before my trip. This adapted recipe comes from my friend Heidi’s newest book, Super Natural Everyday. The book is filled with gorgeous photos, a thoughtful design, and beautifully written recipes. I’ve had several great lunches and suppers thanks to Heidi’s latest book, but these bars have become my addiction. They’re like crack. I’m sure others that have made the Carnival Cookies from SNE will agree with me. I’ve slightly modified Heidi’s recipe. Allow me to explain: when I planned on making the cookies, the Whole Foods closest to Penn Station decided to have a sale on extra virgin coconut oil. And that lovely sale lead to an empty shelf. There was not one jar of the stuff left when I got to the store. I can spend all day whining how the shelf was bare, but I found an equally delicious alternative that makes having no coconut oil on hand a minor issue. My alternative is not as healthy as extra virgin coconut oil, but it sure is delicious. Can you say brown butter? In addition to switching out the extra virgin coconut oil for brown butter, I forgot about the peanuts all together. Instead, I mixed in equal amounts of roughly chopped pistachios and macadamia nuts. My laziness also got the best of me, I smooshed all of the cookie dough into a parchment-lined tart pan and made carnival bars. Of course, I couldn’t stop there. The bars longed to be smothered in a glorious blanket of melted dark chocolate. Are you counting the calories? I am pretty sure I lost count after the brown butter was mixed in. Whether or not these have only a few billion more calories and grams of fat than the original recipe, I can’t find it in me to apologize about my inclusion of the brown butter. Brown butter is a gift from the heavens (well, it is in my own little world). If you’re wary, lazy, or lack time to make brown butter, worry not- I’ve included an alternative in the headnotes of the recipe. To make your own almond meal, simply drop ½ cup (60g/ 2oz) whole almonds (skin and all) into a food processor until they have a texture of sand. Don’t process the almonds too much because you’ll then end up with almond butter, and although that is lovely, we don’t need that for this recipe. Instead of brown butter, ¼ cup (60ml) of extra virgin coconut oil (like in the original recipe), or simply- ¼ cup (½ stick / 4 tblspns / 2 oz) butter work just as great. 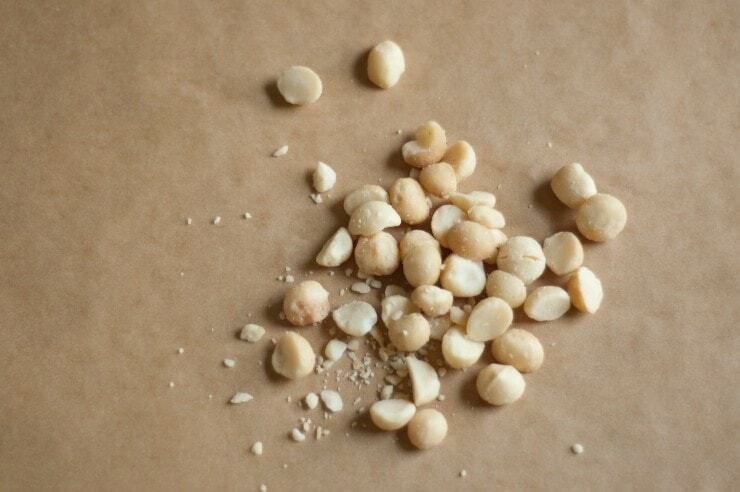 I used macadamia nuts in the recipe, but feel free to use an equal amount of any other nut, or even a combination. These bars taste especially delicious with a macadamia nut & pistachio combination! Preheat oven to 350ºF / 180ºC / Gas Mark 4. Line the bottom and sides of an 8-by-11-inch [20cm-by-28cm] tart pan (or equivalent) with parchment paper. Melt the ½ cup butter in a small pot over medium heat until the butter is a hazelnut brown and gives of a nutty aroma. Strain using a paper coffee filter or paper towel over a fine mesh strainer (being sure that the solids are left behind). Measure out ½ cup / 60ml, set aside for 10 minutes (use the extra to spread on toast; you’ll thank me). In a large bowl, combine the oats, almond meal, baking powder, cinnamon, and salt. In another large bowl, combine the mashed bananas, 1/4 cup brown butter, and vanilla extract. Add the oat mixture to the banana mixture. Stir until combined. Fold in the chocolate, then the nuts, and lastly the popped corn. The dough will be looser than a standard cookie dough, but don’t worry about it. Transfer the dough to the parchment-lined tart pan and smoosh it around to level it off. Bake for 15- 20 minutes, until the sides are deeply golden. Remove from the oven and allow to cool on a wire rack. Melt the chocolate in a double boiler (or in the microwave) until liquidy and shiny. Evenly pour the melted chocolate onto the carnival bars and place the entire pan in the freezer for 15-20 minutes, until the chocolate topping has firmed up and the bars are easier to cut. Cut into 20-24 bars with a sharp knife. In a large, heavy-bottomed pot with a lid, place in ⅓ cup of popcorn kernels and 1 ½ tablespoons of a neutral-tasting oil, just enough to coat the kernels. Place on medium-high heat, joggling and sliding the pan around on the burner. Once the popcorn has stopped popping, immediately remove the popcorn from the pan and place in a large heat-proof bowl. Kamran- Your remark about the sierra of clothing reminded me of my room when I was in uni. Have a fab time talking at Blogher. The bars looks totally fabulous and I like the new personal twists you have added! Sukaina- thanks so much! Usually my room is as tidy as can be, but trips like these make a mess of my room. 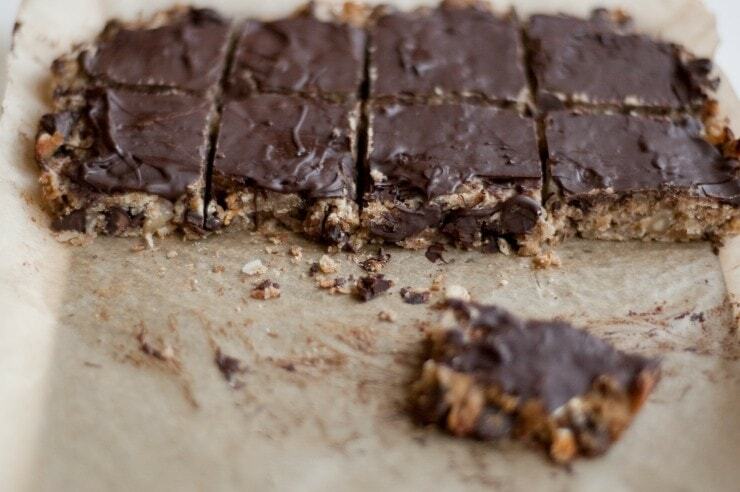 These bars look heavenly – and they seem easy to make too! Out of curiosity, how does the popcorn taste in the bars? 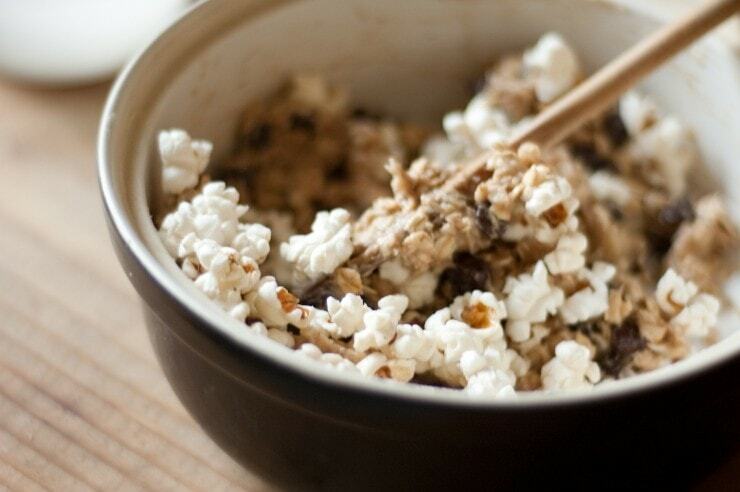 Does it have a noticeable effect on the texture/taste – not a big fan of popcorn hence the queries. Browned butter truly is a magical thing isn’t it? It turns everything it touches into gold, I’m convinced! I’m quite enamored with heidi’s new cookbook as well and am on a mission to devour everything within it’s pages. Love the adaptation you’ve made to these bars! And have a safe and fun trip! These look great! I can’t wait to get my hands on Super Natural Every Day! I adore this book… have since the moment I opened the Amazon box. :-) Great post, my friend! 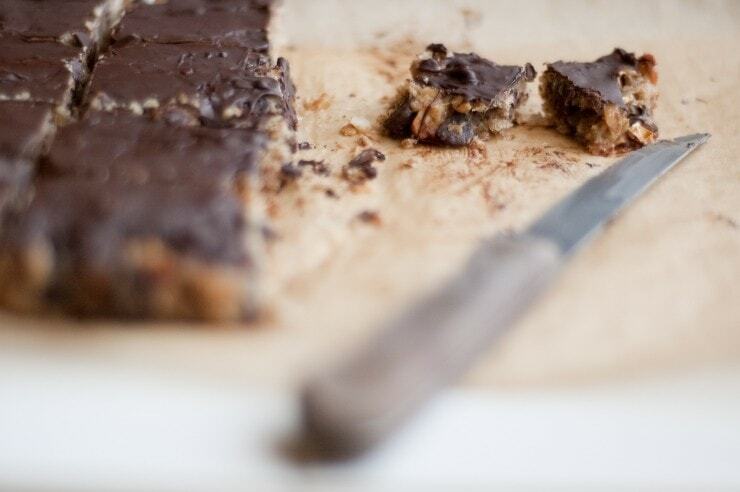 This is an amazing recipe for a unique “cookie” bar. And great pics that really makes us salivate! I only wish I could carry them on my gourmet gift boutique… But I doubt it can ship. I agree. These might be a little difficult to ship. I have to ask for clarification as to why the recipe specifies “⅓ cup (50g / 1.75 oz) unshelled pistachios”? Did I miss something? Is this really the quantity of pistachio (or other nut) called for in its shell? I recently purchased unshelled pistachios at our local farmer’s market, and would love to use them in this recipe, but I am now unsure of the amount that is called for. These look so fantastic! I can’t wait to try them! Brown butter = Yum! These look delicious. I love your blog. I tried making these with puffed rice last night. They sounded amazing and I had the puffed rice to hand and didn’t have any popcorn. This is the first time I’ve made them so can’t compare with what they are like with popcorn but they seemed pretty good with the puffed rice. Although I think I would cook them longer as my favorite parts are the crunchy bits on the edge. What a great bar. So healthy and looks absolutely delicious. Can’t wait to make them for Mother’s Day! These look great! How long will the popcorn stay crunchy for in the bars? I am not sure how long the popcorn stays crunchy for, as every time I make the bars, they’re completely devoured within minutes of being sliced. The popcorn loses some of its crunch after being baked, but it doesn’t lose its complete crunch. 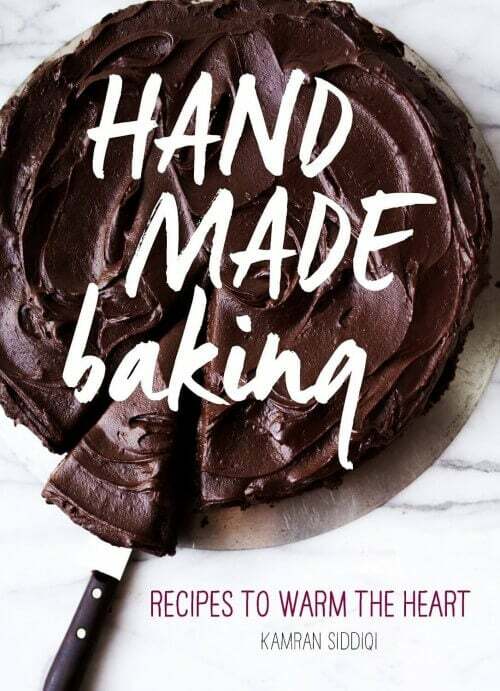 Heidi’s book is on it’s way to me right now via Amazon, and I’m counting down the days til I get it so I can make some of these delicious recipes I see popping up on everyone’s blogs! And brown butter? Definitely my weekend. Your changes have me hooked. I need these right now! I am in my post-lunch sugar craving phase. I can almost taste them through your spectacular photos. These bars sound soo good right now. Just discovered your site, awesome job. I feel like fatty desserts (those using traditional fats like butter, cream, milk, cacao and coconut and *NOT* trans fats/vegetable oils/shortening) are actually much better than desserts that just have a bunch of sugar, for a few reasons. First, the fat slows down absorption of the sugar into your bloodstream. This prevents mood swings and metabolic disturbance. Second, traditional fats like butter are in fact highly nutritious. The saturated fats in butter and cacao boost our immune systems and protect our hearts, helps us absorb the other nutrients in the dish, and just taste terrific. The idea that fat is bad for us is false. Like I say above, traditional fats are healthful, while industrial fats are harmful. Cheers to everyone, especially Mr. Siddiqi!! oh, my, I’ve gotta make these…and soon! thank you! These feel like my childhood! It’s 10:30 AM and now I want a bar!